Union official Al Mixon told the crowd, "I'm not anti the Obama administration. They're putting road blocks in front of what he wants to do"
Five hundred miles from Wall Street, a crowd of roughly 200 marched on downtown Cleveland, in the mid-western US state of Ohio. 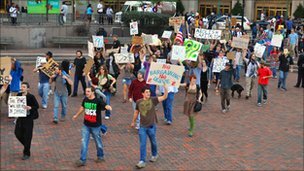 After three hours of speeches, folk songs and group discussions, protesters for Occupy Cleveland marched past city hall to a public square. It is one of the latest manifestations of protests against corporate power and income inequality - all stemming from a continuing demonstration in New York City called Occupy Wall Street. But it remains to be seen whether the "Occupy" movement can channel its energy into real political power, like its conservative counterpart, the Tea Party. 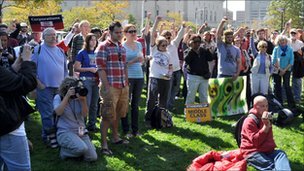 Members of the first Occupy Cleveland protest call themselves "the 99%". It's a reference, they say, to the proportion of American citizens who have suffered in the weak economy as the rich 1% have grown richer and grabbed for themselves an increasing share of political power. People in the crowd both resembled and defied the stereotypes of young anarchist demonstrators. To be sure, some of the group's younger core sported black hooded sweatshirts, tattoos and Guy Fawkes masks. But the crowd included nurses and firefighters, military veterans, libertarian backers of Republican presidential candidate Ron Paul, and a Presbyterian minister in black shirt and collar. One woman carried a sign announcing "If I had a job, I would not be here". Union teamsters marched as well, a sign that industrial support for the protesters was growing beyond New York. Throughout the day, Occupy Cleveland protesters expressed a range of grievances, mostly centred on what they described as the increasing concentration of economic and political power among corporations and the wealthy. Their goals ranged from expansive - curb the power of big business to influence elections - to the immediate - fight Republican efforts to restrict union negotiating rights. 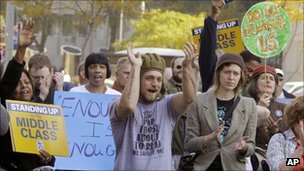 Occupy Cleveland protesters said they were frustrated that the financial situation for many Americans has continued to get worse, while corporate profits have soared. "It's not working anymore," Michelle Mahon, a 40-year-old nurse, said about America's political and economic structure. "This is what we have to do. The only way that social change has ever happened is because the people demanded it," Ms Mahon said. Many of the protesters pointed to a 4-5 decision by the US Supreme Court last year that allowed corporations to inject unlimited amounts of cash into the political system and elections. Greg Coleridge, a member of a organisation affiliated with the Quakers, denounced the effects that decision had on politics and policy. "For a very long time I have been concerned about the growing political and constitutional rights of business corporations to not only influence and shape our economic policies but to govern, to be involved in decisions that affect our communities, and our families, and our environment," he said. However, Mr Coleridge was heartened by the new protests. "Seeing young people get together first in New York, and then some other communities including Cleveland, are things we should all be supportive of." Other protesters had more direct complaints. Retired Cleveland firefighter Michael Parish wore a fireman's hat to the protest. He was there in support of a ballot referendum that would remove restrictions on collective bargaining rights - specifically for public employees. Those restrictions were pushed through by Ohio Republicans this year. "The middle class of this country was built off of what has been demonised now as a 'public employee,'" said Mr Parish, 52. "If it was not for public employees in those positions - teachers, firefighters, police officers, EMS workers - we would be in a third-world country." When the conservative Tea Party movement emerged in 2009, it immediately turned its energy toward electing conservative Republicans. Their candidates pledged to oppose tax increases, cut government spending and block the Obama administration at every turn. The efforts paid off handsomely in the 2010 elections, when the Republicans took control of the US House of Representatives. The "Occupy" protesters as yet have few immediate public policy goals. In Cleveland, they seemed to have little notion of how to channel their energy into the conventional political process. While the Tea Party benefited from the start from the organisational and financial assistance of conservative advocacy groups, it remains unclear if unions and others will fill the same role for the Occupy movement. Many of the protesters on Thursday said they had voted for President Barack Obama in 2008, but had become disillusioned by his inability to breach "political roadblocks" set up by the Republican party. While hundreds in New York City have been arrested for violating traffic laws, protesters here are wary of doing the same. Rebecka Hawkins, one of the organisers, begged demonstrators not to provoke the police. "Our goal is not to get arrested," she told the assembled crowd. "Our overarching message is corporations have way too much power. You don't want the message to be 'Look at these crazy kids causing all this trouble'."